The people of Pre-Islamic Arabia venerated a great many different deities. In the desert, the nomadic Bedouins created open-air sanctuaries, carving representations of gods and goddesses on high-standing rocks. 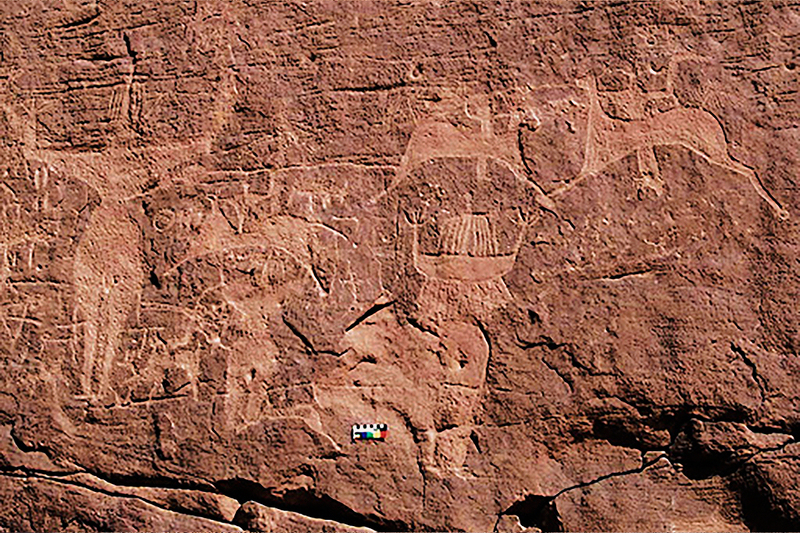 At Wadi Bajdha, north-west of Tabuk in the northern part of the country, a rock art composition featuring bulls and human figures (right) marks the location of an open-air sanctuary in the middle of the desert. As in Egypt, the bull was a sacred animal in Arabia. 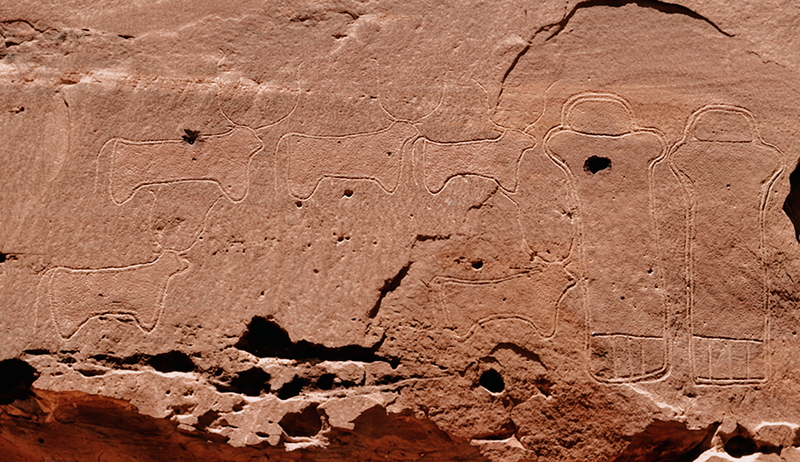 This tableau, whose date cannot be precisely determined, was carved about 5 metres above the present-day ground level on one of the smooth surfaces of a sandstone hill. Offerings might have been placed in the fissures below the image. 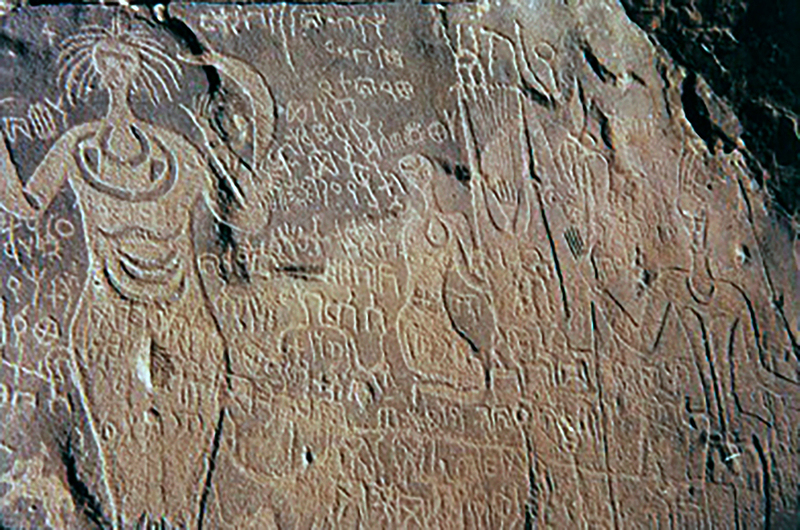 In another panel, the carving of female figures (below left) over earlier Bedouin inscriptions would indicate that they date from a period after the development of writing. These figures have a triangular torso with an elongated neck, narrow waist, wide hips and long hair. They could represent a goddess, perhaps Alia, the goddess of love and fertility. Several figures representing Alia appear on a readily visible vertical surface high up on a hill (below right). The site is close to a watering place that is now dry, possibly a spring or a rainwater reservoir. Sheltering spots under the rock, water and a few plants made this an ideal location for social or religious gatherings. It is possible that rituals took place here and an image of the goddess was created each time, once per year or according to another periodicity. The site remained a gathering place for centuries: there are hundreds of ancient Arabic inscriptions carved all around the reservoir that have been dated to c. 1500 to 1000 BC. These images of goddesses show that the artist(s) worked within precise guidelines, each time using the same theme, motif and style, from which they could not deviate. Some ancient artists probably specialized in religious images, always reproducing the same subject(s) with no formal or stylistic variation. This would explain why identical representations of the goddess Alia have been found at nearly all the sites. There must have been a few recognized artists who, conforming to their society?s religious and cultural prescriptions, depicted only authorized figures strictly according to the imposed rules, which explains the absence of aesthetic differences and indeed of variety in the artistic creations. 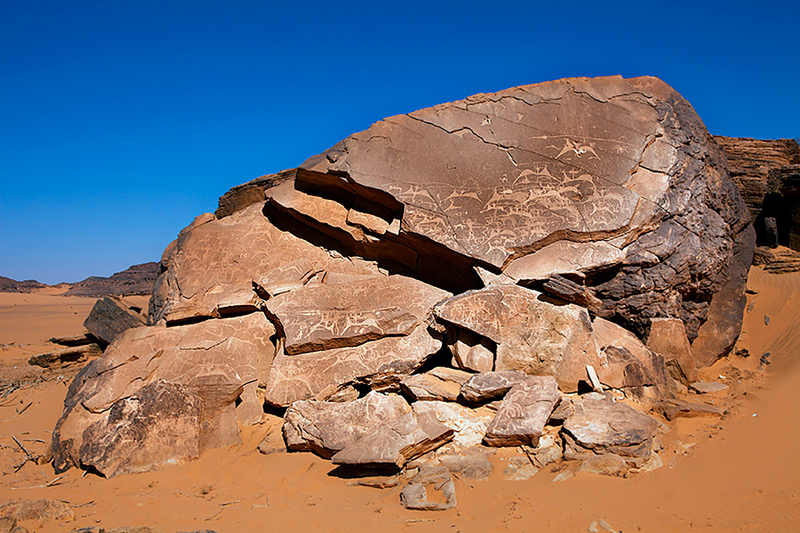 In the Najran region of southern Arabia, a prehistoric artist adorned the smooth surface of a large rock with one of the most remarkable and fascinating works of art ever created (left). When the sun rises each day, the figures of this panel, which faces east, gleam and sparkle in the first rays of sunlight. Originally the composition apparently consisted of only the male and female figures, plus the stag off to the right, which was carved using the same pecking technique and has the same kind of chisel marks as the main figures. Over time, this tableau lost its importance. The place was no longer considered sacred and the local population forgot about its traditions. Visitors began carving their own names and other texts on the rock and over the figures, which are nonetheless well preserved and still have all of their beauty and evocative power. This work has not been precisely dated, but it certainly preceded writing by at least two thousand years. For a long time archaeologists thought that the Bedouins, as nomadic herders, had left few traces of their presence. But more recent studies, including many devoted to rock art, have disproved this assumption by discovering a considerable quantity of cultural materials in the deserts of Saudi Arabia. The animals depicted correspond to the local fauna: cattle, camels, stags, gazelles, dogs, snakes, lizards, goats, etc. The flora is surprisingly absent from the images, except for representations of date palms at a few sites, as are birds, with the exception of ostriches. The artists seemed to choose the elements of their compositions from among a few animals that were part of their environment, to the exclusion of others also present. This same phenomenon has been observed in Europe, Africa, Australia and Asia, indicating that artists in different parts of the world all shared the same mental, intellectual and ideological approach. From the Neolithic to the early Islamic period, the evolution of rock art shows that the desire for aesthetic achievement is not specific to contemporary civilizations, but was already a deep-seated preoccupation in the minds of our ancestors.